You may write a routine, ordinary, curriculum vitae or CV form, or you may write an interesting one. Find out below how to create a curriculum vitae, which is sometimes abbreviated to CV, without any mistakes and misprints so that it is professional and fulfils the desired purpose. The term "curriculum vitae" stands for the most important document in your life. This document presents your biography, or a cross-section of your professional life, to your new potential employers. The term curriculum vitae or sample CV comes from Latin and its literal translation is "course of life", which perfectly describes the contents of this key document of each individual who has looked for a job at least once in his/her life. The overall standard of a CV, or curricula vitae, has been constantly increasing in recent years. Why is that so? It is caused by the decrease in the number of well-paid jobs and the increase in unemployment. This is causing extreme pressure on the labour market between those looking for a job and the number of vacancies. Unfortunately, this means that companies and employers are currently one up on the people looking for jobs. They can select their new employees from a great number of applicants. Below you will find a example CV you can use. Why is it impossible to underestimate the importance of your professional CV/résumé? Nowadays, it is not surprising at all that each of us has to face high demands. Moreover, the so-called globalization we are witnessing today does not help us in this respect in any way. Nowadays, we must be almost perfect in all aspects in order to be successful. And a curriculum vitae is only one of the things to start an application for a good job. And although the curriculum vitae, or just simply sample CV, is just the beginning, it is definitely worth the while not to underestimate it. What should your "course of life" look like? How long should it be? A curriculum vitae, the so-called "course of your life", briefly but concisely conveys your profile in a chronological way on one to a maximum of two A4 pages! Have you ever heard that the first impression is the most important? That applies doubly to a curricula vitae! It is the curriculum vitae and the motivation letter that make the most important, first impression on your new employer who you are trying to commence employment with. If your curriculum vitae is of low quality and your structured CV makes a bad impression on the company, it is obvious that you will not get a chance to take part in the following round of the selection procedure, which will be conducted, for instance, in the form of a personal interview. Is that cruel? By no means! That’s the reality. That’s just the way it is! What should your curriculum vitae look like to be accurate? Date and your own signature to confirm the truthfulness of the information included in your curriculum vitae. And what about some "tricks" to help you? Interested? Perhaps you think that there is nothing to creating a curriculum vitae. Anyone can do that on the basis of the instructions provided above. It is true that it may seem so but there are small differences which will enable you to draw attention to yourself, attract the attention of the employer, and increase the success and efficiency of your curriculum vitae as such. Please read very carefully from now on – we definitely recommend that you attach your curriculum vitae with a photograph of you to make your model CV more credible. Carefully select a decent, elegant, nice photograph displaying your face very well. Smile in the photograph! But only slightly! :) Nothing should be overdone. There aren’t many people that routinely attach a photograph to their curricula vitae. Believe me that companies quite significantly choose on the basis of their overall impression, not only on the basis of your education. Another improvement in your curriculum vitae consists in your own signature as mentioned above. It is a good idea to supplement your professional CV with your signature and a simple sentence, e.g. : "In witness of the truthfulness of the data provided by me, I attach my own signature" – it looks very good and companies rarely get such a sincere and wholehearted curriculum vitae. Is there a secret for creating a good curriculum vitae to get a good job? Companies want wholehearted, loyal employees even more than people with multiple degrees. Remember that! 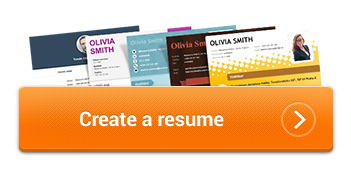 If you are interested in other secrets of winning out over the hard competition of the unemployed, we recommend that you do not overlook the possibility of having a professional curriculum vitae generated easily and quickly by the so-called online CV generator (here), using colourful, elegant, design templates. What’s more, the generator will automatically check your mistakes and misprints. Enjoy our beautiful, modern CV templates! Good luck in getting your new job and new future! How do recruitment agencies see your CV? The term "curriculum vitae" means "course of life" when translated literally. It is a set of information on the job seeker’s professional life, a brief document which usually serves as the first step in the process of getting a job. You may frequently encounter the term abbreviated to CV. However, be careful about the interpretation of this term in individual countries. In certain countries, the term "curriculum vitae" means the English version of a structured CV. You may have a professional CV generated very easily and quickly here. However, you may encounter a different interpretation of the word in other countries. An equivalent of the structured CV is the so-called resumé, which is much shorter when compared to the curriculum vitae. Nevertheless, you may naturally find more differences between the said documents. You may read about the differences in Résumé, CV and Structured CV – What is the Difference?